Situated at the western edge of New York state, the Buffalo-Niagara region is experiencing a surge in fast-growing startups, unique methods of raising funds and a dedicated group of leaders supporting and investing in the growth of this entrepreneurial ecosystem. Already in 2016, five of Buffalo’s startup companies have raised early-stage capital rounds. Sentient Science, a materials science-based predictive software company, led the way closing on a $17 million round from California-based Toba Capital. Other companies bringing in investment capital include: Trove Predictive Data Science ($11M), Graphenix Development ($1.5M), Empire Genomics ($300,000) and Rachel’s Remedy ($245,000). ACV Auctions: Convenes a handheld, real-time marketplace for car auctions. An intuitive five-minute process of snapping pictures and drafting a vehicle description launches an auction to hundreds of registered buyers. ACV Auctions won $1 million in the 2015 43North competition. Loupe: Finds deals at the best local restaurants in your area, plus curated list of top places to eat organized by distance and tailored to food preferences. Painless1099: Simplifies the complex world of taxes for independent contractors (think: freelance designers and real estate agents). This allows contractors to focus on their work, while automating savings and avoiding the unexpected bill from the IRS during tax season. Painless1099 won $500,000 in the 2015 43North competition. In addition to these companies, nearly 40 members of Buffalo’s entrepreneurial ecosystem are converging on Collision to promote the region’s growing tech scene. Buffalo’s investment in entrepreneurism starts at home. In late 2015, the city hosted its second annual 43North Week – the home stretch of its $5 million startup competition that engaged innovators, entrepreneurs and startups from around the world. The week-long event featured events including Buffalo StartUp Weekend, StartUp Grind and Bright Buffalo Niagara for aspiring startups to network, pitch and raise visibility among investors as the next generation game changers. 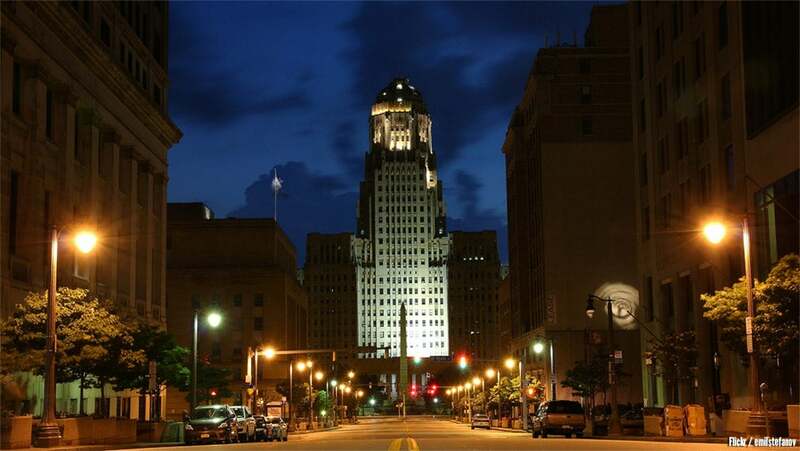 This culminated with 43North awarding $5 million in prize money to 11 teams that relocate to Buffalo for a minimum of one year to help grow their business. The third year of this competition is now underway and accepting applications worldwide. In addition to 43North, more new sources of growth capital are becoming available in the Buffalo area. Prominent business leaders are developing venture capital firms such as Lorraine Capital and Buffalo Capital Partners to back scalable companies in their community. Nonprofits in the area are also getting attention. For example, LaunchNY – a nonprofit venture development organization – recently created a seed fund to help entrepreneurs creating new high-growth companies based on hard science. The New York State Innovation Venture Capital (“NYSIVC Fund”) is an early-stage venture capital fund with $50 million to support and attract new high-growth businesses. There’s no denying that the growth of tech communities continues to be an important catalyst in the resurgence of several U.S. cities. As with any startup venture, there is risk involved. However, Buffalo has found strength in its collaborative support and vision to invest in innovation. It owes its bright future to the ideas and collective entrepreneurial spirit that continue to drive it forward. If you haven’t yet, make sure to nominate a startup in your city for the Launch Pad PITCH competition. This article is part of a Launch Pad PITCH series which serves to highlight the ecosystems and startups represented. Alan is passionate about marketing the Buffalo Niagara region nationally and internationally. With a focus on the life sciences and advanced manufacturing industries, as well as early-stage companies, he works with companies to determine their needs and then facilitates relationships that will help that company bring its business to Western New York. A Buffalo native, Alan holds a Masters in Business Administration from the University at Buffalo’s Professional MBA program and a bachelor’s degree from the University of Toronto with concentrations in political science and sociology.